We have all known times when we, or some loved one, needed blood and we could not get it. The reasons may be numerous. Perhaps the blood needed is of a rare blood group, or perhaps there are no real blood 'banks' nearby! Often times in developing nations the supply mechanisms are just not in place or not functioning. Then there's the ubiquitous shortage of blood donors! Blood bankers are the people on the spot when blood has been prescribed for a patient but apparently the blood is not available. What do you do? Fortunately, nature itself has given us a few 'tricks' that can prove useful in times of crisis! The first and foremost trick is to use the component parts of blood to treat specific needs. As mentioned in my previous post, blood component use can expand the utility of a limited resource (blood and blood donors) to provide help to 3 or 4 times as many patients. Especially in times of scarcity that's a huge, huge advantage! 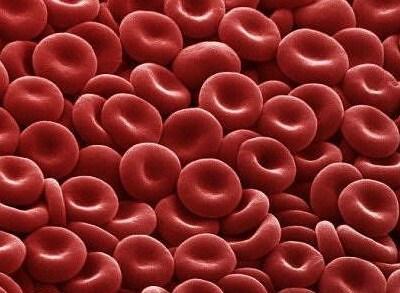 Nature's boon to us is that "blood" (meaning 'whole' blood), can easily be divided up into its parts, or components. 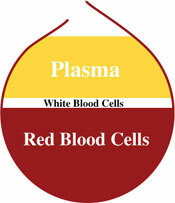 A simple centrifuge spin will show two clear divisions, with straw yellow watery plasma on top (less dense) and the dark red cells below. Using multiple bags, the plasma can be removed into a satellite bag. If we have spun the blood gently, then within the plasma will be found the platelets. Platelets can then be concentrated with a slightly harder spin yielding platelet poor plasma (PPP) on top and the platelet concentrate at the bottom. So now we have three components of blood. Very rarely do people need more than one of these at a time. Voila, 1 blood donor can help to treat 3 patients! The plasma (PPP) with its clotting factors can be fast frozen (now called "Fresh Frozen Plasma" or FFP) and then stored at -40C for up to one year. All the clotting factors will work! Sometimes, we will choose to remove some of the clotting factors (V and VIII with fibrinogen) from the plasma and use these separately for treating people like hemophilia sufferers. And there we have it, easily up to 4 different patients can be benefited from one blood donation! Nature also lends us a helping hand for patients with rarer blood groups (e.g. often rh negative blood and AB group blood can be hard to find as occurring in only a small percentage of donors). 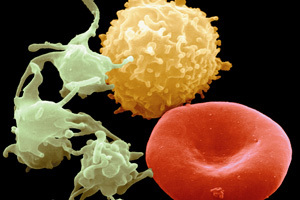 The basic 4 blood groups (A, B, AB & O) were discovered more than a century ago. Rh factors were detected in the 1940s-1950s and were first found from studying problematic pregnancies. Thus, the rh 'problem' for rh negative women has become a matter of common knowledge. Now, a whole science of blood group serology has grown out of these humble beginnings! When we make blood components we first separate the plasma from the red cells. Here lies nature's second BIG gift to us. Factors like rh and A and B that are the basis of the blood groups, are found ONLY on the red blood cells. These factors do not exist in the plasma. What is found in the plasma, are plasma proteins (immunoglobulins) that can potentially attack their opposite red cell factors. We are born with some of these proteins (anti A and anti B, but not rh). 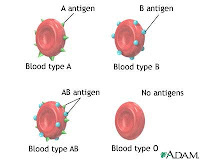 People with a blood group A, for example, will have the A factor on their red cells BUT their plasma will have anti B. It is a bit difficult to understand at first but the tables below summarize the antigen factors (red cell) and antibodies (plasma) for the ABO groups. So, how does this help? Well, supposing your patient needs AB group blood (red cells) and you cannot find a blood donor of AB group, it's actually generally just as safe safe to transfuse (crossmatch compatible) washed A group, B group or even O group RED CELLS alone to this patient!!! Simply put, whatever is on the patient's red cells - the corresponding antibodies in the plasma must be avoided. 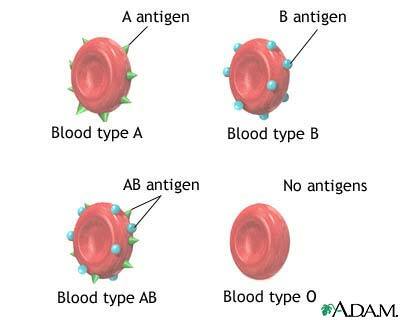 An A group patient can receive O or A group red cells safely but NOT B or AB. Again the table below will clarify the mixes and matches for red cells (packed red cells as they are often called) and for plasma. The reverse case is therefore true for patients needing plasma! Consider the last column of the same table to decide on plasma compatibility: As you can see, an A group patient can receive A or AB plasma, NOT B or O. For people needing whole blood, with a little immagination you can see that the combination of O group red cells and AB plasma are always acceptable (when the crossmatch is okay)! Other combinations will work too, e.g. 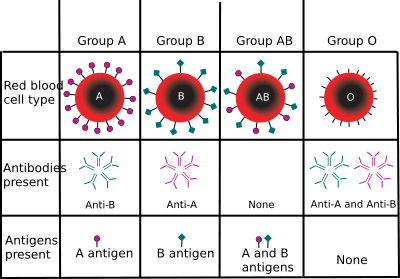 an A group patient needing whole blood can have O or A red cells along with A or AB plasma. A huge advantage of component separation is that when we fresh freeze plasma we can store large quantities of plasma to be used whenever needed! 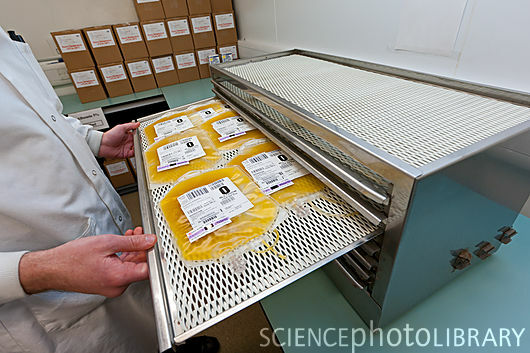 'Packed' red cells can be safely stored for 35 to 42 days at +4C, and in fact with some extra technology (and cost) red cells can even be viably held at -80C (or in liquid nitrogen) for very long periods (up to 5 years). The science of blood group serology has taught us that there are well over 300 different antigen factors found on red blood cells and (in other patients) corresponding antibodies found in plasma. Most of these are rare, but any active transfusion service will run into 1 or 2 a week. 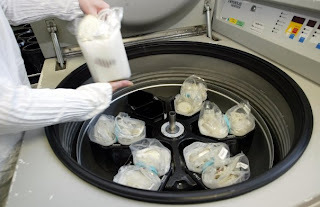 It is for these rarer cases that larger transfusion services will freeze and store away the rare donor red cells that come their way so that when a patient presents with a troublesome rare antibody, there is a better likelihood that compatible frozen red cells will save a life. And that is another reason why crossmatch techniques have to be the best possible! 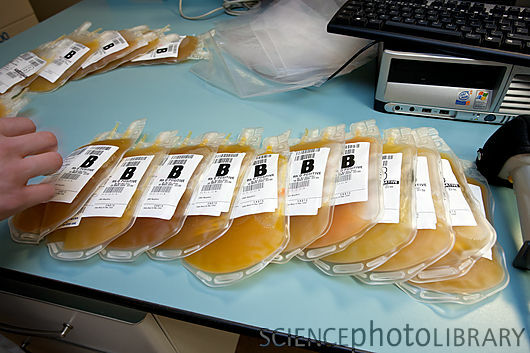 You will not pick up any of these dangerous transfusions (or 'rare' donors) unless the crossmatching is always spot on! But we are now speaking of rarer difficulties (often 1:10,000 or rarer). But, some more common problems that we face are also amenable to some 'trick' solutions! Take the case of a patient with low platelet counts who has started to bleed. The commonest causes might be a virus such as dengue, a drug (medication) reaction, or perhaps treatment for cancer. Whatever the case, platelets once needed are needed in some quantities, say 2-4 random donor platelet concentrates every 12 hours (the actual need will be decided by the physician and the clinical condition). Finding donors can get especially difficult when the patient has a rarer blood group such as AB or rh negative. One unit of Platelet Concentrate has about 50 to 70 mL of plasma but it also will contain a small amount of red cells, say 1 or 2 mL, and that's the reason for generally transfusing platelets according to 'red cell rules'. That small amount of red cells is enough to stimulate the production of antibodies like anti rh. Still, in a pinch, for MALE patients with life threatening bleeding, the physician may go ahead and transfuse blood group incompatible (but major crossmatch compatible) platelet concentrates. Centrifuging blood in blood bags. Where rh negative WOMEN patients are concerned, it gets complicated. 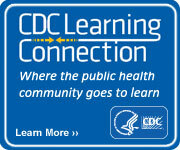 Sometines women who have not had children have been found with rh antibody due to careless transfusions, pregnancies in the past, or other exposures to rh antigens. Still, a potential way out here is to use RhoGAM (which is nothing other than rh antibody) to bind the few problem-causing rh positive red cells found in platelet concentrates. In other words, we can do what we would do when an rh negative women is pregnant to prevent her own immune system from producing the rh antibody against the red cells from her fetus that may be crossing into her circulation! Of course, the above are all purely medical decisions and only doctors can decide in each case what can and should be done. The blood banker's job is to make the solutions available to the physicians. And as you can see, with sensible blood component technology backed with simple blood serology techniques, MUCH indeed can be done. MOST IMPORTANTLY our blood needs can mainly be met using simple, ready to hand, inexpensive "third world ready" technologies. The PRP on the left top has too many red cells (pink). QC is a must! Blood bankers should always fine tune their crossmatch techniques to ensure that dangerous transfusions are avoided. Quality control is most critical in building physicians' confidence in your blood component program. The components, especially the very sensitive platelets, should have high enough counts in our PLT concentrates. We should aim to harvest 90% of the platelets from the donor blood into each concentrate and with the least contamination of red cells possible. The platelets should of course be viable, so gently spin out and gently agitate during storage while maintaining strict temperature control at +22C. As the physicians' confidence grow, and as they see their difficult transfusion problems being solved with component technology and common sense, you will find that they will soon switch over to prescribing only blood components! I think it is ridiculous to expect patients to cough up (India/Pakistan) Rs. 15,000 or more for each single-use disposable kit (for automated apheresis). At least encourage the use of random donor platelets if the manual apheresis technique is deemed "risky." My estimate of the cost of 2 units of platelets taken by manual apheresis at one donation by one donor is a minimum of Rs. 500 to a maximum of Rs. 1,000, depending mainly on whether the Blood Center is adding in overheads etc. to the 'bare' costs. That's for 2 units of platelet concentrate! RED CELLS (packed red cells PRBC) 180 mL to 200 mL, ~80% cells, <10% plasma, ~15% anticoagulant-additive (storage at +4C up to 42 days). FRESH FROZEN PLASMA (FFP) 200 to 220 mL plasma, 30 mL anticoagulant, < <0 -40c="" .5="" 1="" at="" cells="" p="" red="" storage="" to="" up="" year="">PLATELET CONCENTRATE (PLT) 50 to 70 mL plasma, each 1 mL typically contains 120,000,000 platelets, and a minimum of 5.5 x 10 (10) in 50 to 70 mL of plasma with less than 1 mL red cells. (storage at +22C with gentle agitation for 5 days). For an average adult patient of 70 kg weight, the 'normal' blood volume would be 5 liters, and one unit of platelet concentrate should raise the count by ~ 10,000/microliter. BLOOD COMPONENTS ARE A MATTER OF LIFE! 1. Please do keep in mind that platelets once opened for transfusion cannot be stored. They should never be refrigerated even for short periods of time. Only +22C storage! If you use a part of a PLT concentrate, say for an infant, please discard the remainder and do not attempt to keep this for later use as the risk of bacterial contamination is extremely high! Once transfused, the platelets will usually take some time, a few hours, to equilibrate and start working to stop bleeding - an important point when preparing a patient for surgery! 2. A good antibody screen can be sometimes substituted for, or added to the crossmatch to make it even safer. 4. I have not mentioned autologous blood transfusion here as this post is not really about blood for elective procedures, BUT the overall demand on donors for a transfusion center/blood bank will somewhat reduce if surgeons are also utilizing prior autologous transfusions. 7. Be proactive and prepared! Find the phone numbers of the blood banks in your area (the ones that have stock of blood components) and store them up in your mobile for instant use. In an emergency, getting blood components fast can save lives. 8. Blood donors can encourage their blood banks to process blood into components. Ask your blood banker the next time you donate blood, whether they are routinely making blood components so that each time you donate, you will help to save 3 or even 4 lives. OK, important comment to me via email! "Your costing for platelet concentrates by manual apheresis seems low." Well, when one is doing manual apheresis it's usually a "directed donation" i.e. meant for one particular patient. In that context, the plt conc will be used almost immediately or at most within 24 hours. There is therefore NO NEED to use a polyolefin platelet bag that is designed for storage for 5 to 7 days. Using an ordinary multiple bag cuts the cost of the double bag down to what I have indicated. Additionally, my own thinking on platelets and indeed FFP or cryo is that these components are 'extras' and do not need to figure much in costing out in any case. What should be the practice in a not-for-profit blood center is for the entire cost, triple bag, testing, overheads, to be borne by the Red Cells (PRBC) and only nominal charges, e.g. Rs. 100 or $2 for each of the other components. I have tried this out in my project consultancy and have had excellent results. If, on the other hand, the other components are charged even 'at cost' (especially for platelets and FFP) these will go to waste in large quantities and the patients that should be having their lives saved by their use, will die!